Roger Federer beat Ivo Karlovic 6-3, 7-5, 7-6(3), Andy Murray beat Juan Carlos Ferrero 7-5, 6-3, 6-2, Andy Roddick beat Lleyton Hewitt 6-3, 6-7(10), 7-6(1), 4-6, 6-4, Tommy Haas beat Novak Djokovic 7-5, 7-6 (6), 4-6, 6-3. Q. Before the tournament started, you said you wouldn't start thinking, it wouldn't creep into your mind, about Pete's record until maybe the semifinals. Now you're here. What are your thoughts about Pete's slam record and your opportunity here at Wimbledon this year? ROGER FEDERER: Well, first of all, I'm happy the way I'm playing, which is always most important, is to focus on my own game. So from that standpoint, obviously everything is good. I just won, you know, my quarters, so obviously my mind has not started wondering yet. I think tomorrow, you know, I'll prepare for a tough weekend ahead of me, you know, heavily. Against Tommy I have to play, you know, a good match from the start. And as we saw in Paris, it was brutal. Yeah, it's gonna be tough. But, you know, I'm happy to be back into another semifinals. 21st in a row. It's amazing. Means the world to me. Let's see what happens now. Q. Wimbledon has been a happy hunting ground for German tennis players in the last 25 years. Are you beginning to believe that you might be able to follow in their footsteps? TOMMY HAAS: Those are big footsteps to get into. I mean, obviously Steffi had such great success here. I was watching Boris when I was young. Every year I was looking forward to watching it on TV, him playing Wimbledon. He had, what, seven finals here; he won it three times. One time Michael Stich came along and beat Boris in the finals. We were very blessed in Germany having three of those players. So it was very hard for all of us to maybe try to get in their footsteps. But I don't think you really want to get in their footsteps. You want to try to maybe accomplish some of the stuff they have, but it's not an easy task. I think German tennis is still, in many ways, if you look at the past with Kiefer or Schuettler, we've had some success with getting very far in Grand Slams. Not as much as they have. Which country has, by the way? How many Steffi Grafs are there, or Boris Beckers? There's not many. We just go out there, I just go out there and try my best no matter what. You know, like I said, my next opponent is somebody that's probably gonna go down as the greatest player ever. It's gonna be a tough hurdle to go by, but we'll see what happens. It's not over yet. Q. You mentioned a moment ago that your next opponent will probably go down as the greatest player ever. What do you marvel at most when you consider what has made Roger the greatest? TOMMY HAAS: What do I like about his game the most or in general? TOMMY HAAS: Oh, well, let's talk about that after the match. Q. Have you got anything left in the tank for Andy Murray? ANDY RODDICK: Yeah, I should. I mean, I felt fine out there physically. I'm sure I'll pull up a little bit sore tomorrow, but that's to be expected. That's not a new condition. Q. A lot was made after Monday's game about Andy Murray's recovery, that he's only 22. You have four years on him. Is that a significant time in tennis or are you still there or thereabouts at the same level as a 22 year old? Q. Yes. Is it a significant time factor, that four years, in your recovery compared to his? ANDY RODDICK: Not yet. I'm sure when I'm 30 it will be. You know, you can look at it in years. Also matches played. I've played a lot more in my career. But, you know, I'm looking at it as far as a two day thing, not a years thing. At this point I feel fit and I feel healthy. You know, I'm in better shape now than I was when I was 24. Shouldn't be too much of a factor. Q. Is it possible to grind with him and win? ANDY RODDICK: You're gonna have to do some of it. You're gonna have to. You know, obviously I'm not gonna get into a match where we're both trying to poke the ball around on the court. That probably wouldn't work. But you're gonna have to do it at certain times, for sure. Q. 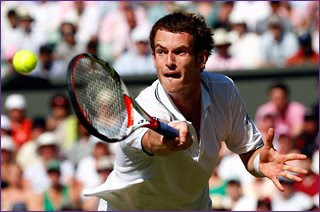 What do you think are the weaknesses of Andy Murray's game? ANDY RODDICK: That's one of the things. He doesn't really have a lot of weaknesses, or any for that matter. He's improved his serve a lot. He returns well. You know, but to be fair, once you get into the top part of the game, that's why a lot of the guys are up there. Q. Having come through that, having won comfortably today, do you feel unstoppable now? Do you feel this is the best tennis of your life? ANDY MURRAY: No, I understand that I can lose the next match if I don't play my best. That's been one of the things that I've learned, and it's made a huge difference to me over the last year or so. I realize that if I don't bring my best game then I'm gonna lose to guys like Roddick. 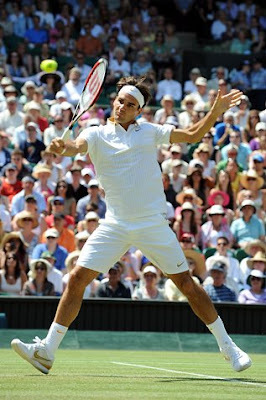 I feel confident because I've won a lot of matches on the grass. But every day when I get up to play the matches, I know that I'm gonna have to perform very well, and that gets the nerves and the adrenaline going and makes me play better.